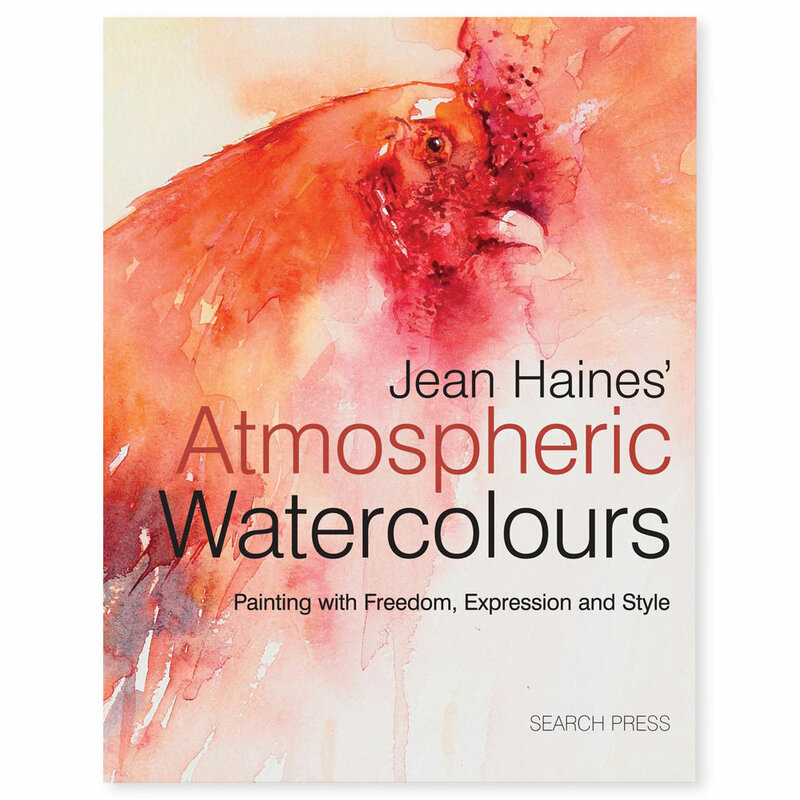 Jean Haines’ enthusiasm for watercolours burst through every page of this inspirational book that will guide you, step by step, to creating beautiful and unique paintings of your own, whatever your ability. Accomplished artist Jean Haines shares her passion for watercolours in this wonderfully practical book. Known for her exciting techniques and love of colour, Jean takes you on an inspirational painting journey on which you’ll encounter, amongst other things, magical watercolour flow, glorious washes, sunbursts, and a magnificent ‘hotting it up’ finale. With her simple exercises, clear advice and easy-to-follow projects, Jean pushes the boundaries and will alter the way you think about watercolours and painting for ever. With a selection of popular subjects, including animals, landscapes, buildings,flowers and people, there is something for everyone here, whatever their artistic ability. A unique and inspiring book suitable for people of all artistic abilities. Packed full of exercises, projects and easy-to-follow advice, as well as numerous finished paintings to excite and inspire you. Jean Haines’ techniques can be applied to flowers, landscapes, buildings, animals and people, so whatever subject you are interested in, you will find it in this book. Well known for her enthusiasm and passion for art, Jean Haines covers a wide range of subjects in a loose and interpretive style. In the 1990s she studied Chinese Brushwork in Hong Kong, which she now incorporates in her expressive watercolours. Light, colour and sections left to the viewers' imagination play a vital role in her paintings. In 1997 Jean moved to Dubai where she held workshops and courses and participated in many prestigious events at major galleries. Her work soon became collectible and she has since sold many pieces which are now in homes all over the world. Following a short period in both France and Belgium, Jean returned to the UK in 2006, and now regularly exhibits and hosts international watercolour workshops for artists from all over the world. She has won many awards for her outstanding work, most recently the Society for All Artists' Professional Artist of the Year, Experimental and Abstract Award. DO NOT BUY THIS BOOK Unless you want to be completely addicted to painting watercolours. I never buy art books as most are an ABC on how to paint a tree, landscape, vase of flowers and everyone who reads the book produces almost identical paintings. This book will not do that. Jean teaches you techniques that you can apply to your own style of painting, so you unlock the artist within you and develop and grow as an authentic artist in your own right. I have painted subjects I never dreamt I could paint before I read this book. Jean is such a charismatic person, her enthusiasm for her subject is contagious. So, if you buy this book and cannot concentrate on anything for thinking of painting, or can't sleep for the same reason, don't blame me, I did try and warn you! p.s. The first painting I did after learning Jean's techniques helped me secure my first exhibition! Search Press doesn't publish many hardcover books, but when it does, I expect something a bit special. This is no exception to the rule, so prepare yourself for a large format coffee table book filled with sumptuous illustrations. Her is a book to get your creative juices flowing and make you abandon the coffee in favor of your easel. Well, maybe that is overdoing it a bit, but the subtitle of this book is painting with freedom, expression and style. Ms Haines' painting style verges on the abstract in many cases, and comes across as being free and spontaneous. East meets west here as the author talks about her love of Chinese brushwork and brings some of that to her work, as well as a lot of sheer enthusiasm and a throwing away of the rulebook. I'm always keen on people who do that, and there are lots of exercises to try out to free up one's hand and generally have fun with paint. Of course, you can expect all the usual topics found in books on watercolor painting: working with color, mixing washes, choosing materials etc. But here they are explored in unconventional ways, and I can recommend this book to all those who think they can't paint and find most painting styles too rigid and structured. There is a lot in here and all of it is suitable both for beginners and those who have painted for years but want to try something new. A lovely book that should have wide appeal, I enjoyed Ms Haines' huge enthusiasm for her subject. Encouraged by the saying 'don't be a sheep, be unique', Jean Haines hopes to bring the best out of all artists by being more creative with the colours they use, the freedom of their brushstrokes, or simply an attitude of mind. Techniques, such as using your brush to its full potential, applying washes and, in particular, using colour, are described in great detail with many step-by-step examples and projects to follow. If nothing else, Jean's work is sure to inspire you to let go of some of your inhibitions. It simply dazzles on the page and makes you want to grab your brushes and get going straight away. Nothing short of fantastic. I first fell in love with Jean's work when she wrote 'Colour and Light in Watercolour', I thought it was wonderful and still do. Yet with this new book, we've moved on ten steps ahead. You have to buy this book if you are remotely interested in watercolour. Known as a difficult medium to master, Jean shares her knowledge and style so that we can learn and improve. Her loose style won't be to everyone's taste, but you don't know until you try it. Painting this ways liberates your art. The book covers many subjects including flowers, portraits and animals so it has wide appeal. It will take you from first steps yet is still suitable for experienced watercolorists. I love it. This is one of those books where the above-the-title billing for the author is actually more than just a conceit. To call this book just Atmospheric Watercolours would completely miss the point. Atmosphere is one of the hardest words to define in relation to art. On the one hand, we all know what we mean by it: its the sense of time and place that can be achieved by the use of washes, glazes and wet-in-wet, but also by composition and colour choice pretty much the standard technical arsenal, in fact. On the other hand, its a woolly term that really means nothing except that the work has an essential quality of je ne sais quoi. So thats a good start, then. And what do we actually have here? Well, its easy to say what Jean Haines work is. Its definitely well into the spectrum of abstraction, and she uses a lot of washes to create a sense of what her subjects are about, more than just what they are. Is this atmospheric? Not really, if you buy my definition, but do please feel free to come up with a better word. I do think were getting there, though. I dont think this could really be classed as an instruction manual, even though there are plenty of demonstrations and lots of discussions of how Jean works for someone with such a personal style, shes actually very good at this part. Yes, its practical, but the approach isnt half so much do-this, do-that as an analysis of Jeans own working methods and, through that, showing you how you can achieve not so much the same thing, as something similar. This is perhaps a first, and an invaluable aid for anyone wanting to move beyond representation and to develop their own way of describing what they see. If this sounds like the heart of abstraction, it is, and this book is probably one of the best ways of learning about a technique that so frequently defies description and really has to be absorbed rather than learnt. If youve followed what Ive said, then Im pretty sure youll like the book. If not, proceed with caution; it may be that youre not ready for it yet but persevere! Well haven't finished it yet but am savouring every page!!!! It's stopped me eating and sleeping a good thing maybe??? Haven't done a book review before (and after reading this you may think "hope she never does one again!!!!") and maybe I should wait until it's finished but am just a lot excited about this one!!!!! It is full of Jean's secrets written in her own easy, inimitable, encouraging way, as if she is talking intimately to you, the reader. She shares moments and memories of her past..... a lovely insight into the Jean we don't get to hear about..... I have done the first few exercises in the book following just what she did and guess what?????? They turned out and I think the penny might finally be dropping. If any of you have been lucky enough to either see Jean demonstrate or go to a workshop, she makes things look so easy.... well we all know it isn't... right???? Easy comes from years of practice, experience and desire, but.... and this is what I really want to share, this book opens the door and certainly for me has given me those all so sought after glimpses of what I'm looking for...... that's why I was so excited about it and apart from everything else, retiring, exhibition on Saturday, holiday next Wednesday etc etc....... well you can now understand why I couldn't sleep. I said to my husband at 3:30 I think I might get up... he said "What are you going to do.... paint?" Of course I said no....... hmmmm thought she indignantly does he really think I was going to get up and paint at 3;30 in the morning, how ridiculous!!!!!! Am beginning to think he knows me too well (note to self... need to become more mysterious!!!) So hope to read and reread more today and the next weeks and months of course, I think Jean was wise to have this published in hardback as I think it will become one of those "bible" sort of books which in paperback may become too worn!!! Am sorry for those of you who have to wait for a copy, it will be worth the wait I promise!!! Will keep you updated and maybe write another review when I have had more chance to work through and digest... it is a treat for sure. I normally like to flick through books before I buy but I had faith that this one would be what I was looking for and it is ...... in bucket loads!!!!!! It is a book full of hope, colour and life and I hope you all enjoy it as much as I do! !